Dextromethorphan is a salt of the methyl ether dextrorotatory isomer of levorphanol, a narcotic analgesic. It is chemically named as 3-methoxy-17-methyl-9(alpha), 13(alpha), 14(alpha)-morphinan hydrobromide monohydrate. DM occurs as white crystals, is sparingly soluble in water, and freely soluble in alcohol. The drug is dextrorotatory in water (at 20 degrees Celsius, Sodium D-line) with a specific rotation of +27.6 degrees. Dextromethorphan is metabolized by various liver enzymes and subsequently undergoes O-demethylation, N-demethylation, and partial conjugation with glucuronic acid and sulfate ions. Hours after dextromethorphan therapy, (in humans) the metabolites (+)-3-hydroxy-N-methylmorphinan, (+)-3-morphinan, and traces of the unchanged drug are detectable in the urine. The FDA approved dextromethorphan for over-the-counter sale as an cough suppressant in 1958. This filled the need for a cough suppressant lacking the abuse liability and addictive properties of codeine phosphate, the most widely used cough medication at the time. The advantage of dextromethorphan preparations over those containing codeine (now prescription only in the United States) was the lack of physical addiction potential and sedative side-effects. At therapeutic doses, the drug acts centrally to elevate the threshold for coughing, without inhibiting ciliary activity. Dextromethorphan is rapidly absorbed from the gastrointestinal tract, and exerts its activity within 15 to 60 minutes of ingestion. The duration of action after oral administration is approximately three to eight hours. Because administration of DM can be accompanied by histamine release, its use in atopic children is very limited. The average dosage necessary for effective antitussive therapy is between 10mg and 30mg every four to six hours. According to the WHO committee on Drug Dependence, dextromethorphan, when used recreationally (see non-medical use of dextromethorphan), doesn't produce physical addiction but can generate slight psychological dependence in some users. Following oral administration, dextromethorphan is rapidly absorbed from the gastrointestinal tract, where it enters the bloodstream and crosses the blood-brain barrier. The first-pass through the hepatic portal vein results in some of the drug being metabolized into an active metabolite of dextromethorphan, dextrorphan, the 3-hydroxy derivative of dextromethorphan. 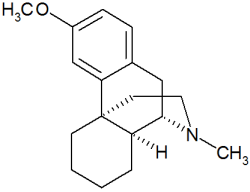 The therapeutic activity of dextromethorphan is believed to be caused by both the drug and this metabolite. Dextromethorphan is predominantly metabolized by the liver, by various hepatic enzymes. Through various pathways, the drug undergoes (O-demethylation (which produces dextrorphan), N-demethylation, and partial conjugation with glucuronic acid and sulfate ions. The inactive metabolite (+)-3-hydroxy-N-methylmorphinan is formed as a product of DM metabolism by these pathways. One well known metabolic catalyst involved is a specific cytochrome P450 enzyme known as 2D6, or CYP2D6. A significant portion of the population has a functional deficiency in this enzyme (and are known as poor CYP2D6 metabolizers). As CYP2D6 is the primary metabolic pathway in the inactivation of dextromethorphan, the duration of action and effects of dextromethorphan are significantly increased in such poor metabolizers. Deaths and hospitalizations have been reported in recreational use by poor CYP2D6 metabolizers. To the Editor: We noted with interest the article in CHEST by Einarson et al (February 2001) focusing on the teratogenicity of dextromethorphan.